Putting together the reading list for the seminar class this semester I ran across an odd corner of the human fertility industry that I never knew existed. I’m picking seminal papers in biotechnology and one of them is the 1992 paper, “Birth of a normal girl after in vitro fertilization and preimplantation diagnostic testing for cystic fibrosis” by Handyside et al. One of a pair of papers that first used PCR to test embryos for genetic disease so that the disease free ones can be implanted. So I looked at where preimplantation diagnostic testing was available in Lexington. There is an IVF clinic that does preimplantation testing–not at the UK hospital, they seem shy of anything slightly controversial. What was odd, is ZDL, a company that sells fertility products for people to use at home, or send in for analysis. 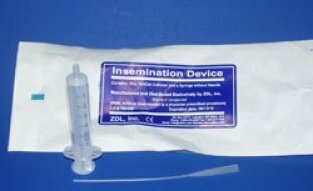 Home sperm counts, insemination devices, and more. Quite surprising! I ran across a caloric restriction study being done with human volunteers. It is the CALERIE study (Comprehensive Assessment of Long-term Effects of Reducing Intake of Energy) being run by Eric Ravussin and Donald Williamson at the Pennington Biomedical Research Center in Baton Rouge, LA. The study will put human volunteers on a diet with 25% less calories for two years to see of the effects of short term caloric restriction affect the body in ways similar to the effects in animals. In animals, 25% caloric restriction increases lifespan by 20-25% and reduces the incidence of many age-related diseases. The results should be interesting. I hope they can recruit and keep enough participants on the low cal diet!